Home Local News & Views SF Bay Area Sophie Maxwell: Why recall? Why now? The exact moment in time has arrived to pull down the veil of the corrupt, ethics depleted political status quo being perpetuated at City Hall via Supervisor Sophenia Maxwell, who represents District 10. Ms. Maxwell reminds me of that old cereal commercial where the children say something like, “Give it to Mikey. He’ll eat it. He eats anything.” Ms. Maxwell is the Mikey for big money interests in San Francisco and other principalities in high dark places. When it comes to committee assignments, the other members of the San Francisco Board of Supervisors say, “Put Sophie on it because, like Mikey, she’ll vote for anything!” Anything they tell her to vote for, that is. But as for her constituents and the people of San Francisco, she has demonstrated she couldn’t care less. As our RECALL effort moves forward, I am asked, WHY RECALL? And more importantly, WHY NOW? Ms. Maxwell will term out in January 2011. Some have said: “She only has one more year. Why put the energy and investment in a RECALL with such a short amount of time left? And since the mayor would appoint the successor, then really, what is the point?” These are valid and excellent concerns. And the answer I present is this: RECALL is IMPERATIVE to SCRAMBLE THE MACHINE. Rest assured Ms. Maxwell’s controllers do not want to see her moved from that seat one second before January 2011. They have a well established relationship and flow with Ms. Maxwell right where she is. Putting the sledge hammer of RECALL to that coup will speak volumes to that power structure. The most recent example of the negative impact Ms. Maxwell had on this community is when her coffer-fillers aided her in manipulating the language of a resolution presented by Supervisor John Avalos on behalf of District 10 regarding the reinstatement of the Restoration Advisory Board (RAB) as it was right before the Navy disbanded it because of that board’s insistence that the Navy hold to its responsibility to truly clean the Shipyard and not allow early transfer of a Superfund site of Chernobyl proportions. Even after about 100 people came to a hearing at City Hall to testify in support of reinstating the RAB after Ms. Maxwell’s string pullers helped her to change the language of the resolution to make it ineffective, so much so that Supervisor Avalos removed his name from the resolution. Ms. Maxwell has become an enemy to her own professed commitments to District 10. 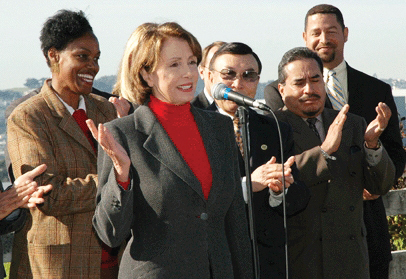 In the election pamphlet for her 2000 campaign she stated that she supported Proposition P, which in short demanded that the Navy clean the Shipyard to residential standards. What has happened to Ms. Maxwell? Was she lying to her constituents when she ran for re-election or is she lying to herself now? Whether she was lying then or she has become an indifferent liar over time supports the fact that she does not need to sit in that critical Supervisorial seat not one minute longer than June 2010, on the day after she is RECALLED. WHY RECALL? WHY NOW? The coffer-fillers are already scrambling. Ms. Maxwell was served the Notice of Intention to Recall on Dec. 10, 2009. The SCRAMBLE is already beginning. Small businesses that had been shunned for years by Ms. Maxwell’s office are now receiving mailings about her wonderful efforts to aid their businesses. Ms. Maxwell, you are a day late and a dollar short. The issues generating this RECALL effort are not light or petty or personal. We are demanding Ms. Maxwell’s removal because of her voting record, her support of legislation that has negatively impacted the community. Equally, her lack of generating substantive community people building legislation related to issues that literally bombard the largest district in San Francisco has effectively demonstrated her disillusionment with hopeful possibilities for District 10, as well as her complete disregard for our critically important long term health. However, challenging the wiles of the political process engulfed me some three and a half years ago when I learned that the big developer Lennar had been sending its workers home due to the excessive hazardous dust exposure on the jobsite, but Lennar was not alerting the immediate surrounding community that they should be closing their windows and staying indoors or whatever the precautions would be to protect their health and safety. After much pleading with the San Francisco Health Department and a slew of other agencies, finally the San Francisco Board of Education submitted a resolution in support of a work stoppage at the Lennar site on the Shipyard in order to allow an independent company to test a sampling of residents, including children and the elderly, to ensure their health considerations were being put first, as the Precautionary Principles of San Francisco mandate. Hundreds of people from the community came to City Hall to speak on their support of this temporary work stoppage. I thought surely once our Supervisor heard our outcry she would intelligently and empathetically consider the cause and vote in support of her vast constituency who came to address her and her colleagues in an orderly and procedurally correct manner. SURELY, she needs to reconsider her support of this insidious process of poisoning the weakest as well as the healthiest people of the community. Oops! I WAS WRONG. She in fact became the pivotal vote that caused this well supported community and citywide resolution to be voted DOWN! With her NO vote she solidified her complete disregard for the children, the elderly, and really even those who are healthy and wealthy and live in Bayview. Everyone should take note, as asbestos and other chemically polluted air does not stop at the children and the elderly and the poor. In this brief article an additional compelling point for RECALL NOW I must present to you is the looming most “slap-in-the-face” affront to District 10: DID MS. MAXWELL HAVE HER OWN PROPERTY EXEMPTED FROM THE BAYVIEW HUNTERS POINT (BVHP) REDEVELOPMENT PROJECT AREA? Has the supervisorial captain of the Titanic of the BVHP Redevelopment Project Area prepared a separate escape for when the iceberg of Redevelopment hits the ship of BVHP residents who have not been afforded the luxury of opting out of the massive concocted project area? If she has already separated herself, then District 10 residents have a duty to make it official and unseat Ms. Maxwell. District 10 cannot continue as I did to distance ourselves from this silent attack, hoping that it will just go away or believing that letting this supervisorial seat just ride itself out will not deliver a deleteriously final blow to the future of District 10 constituents’ personal daily lives. Ms. Maxwell and those she truly serves are like a mountain lion pouncing upon the heads of the community of D10, poised in this last year to grip their political controlling fangs around the back of our necks to inflict that deadly legislative bite in order to finally remove any and all opposition to the wrecking plans scheduled for this community. Now anyone would fight against an obvious mountain lion attack. Make no mistake: D10 is under silent siege being carried out by District Supervisor Sophie Maxwell. I implore you to get involved in depth and consider your support of this RECALL. The proponents are awaiting the certification by the San Francisco Elections Department of the petition for circulation. Then we will need everyone’s help to gather the signatures of a minimum of 7,529 voters registered in District 10 by Feb. 8. To get involved, come to the weekly town hall meetings in the school at 195 Kiska Road at 7 p.m. every Thursday. 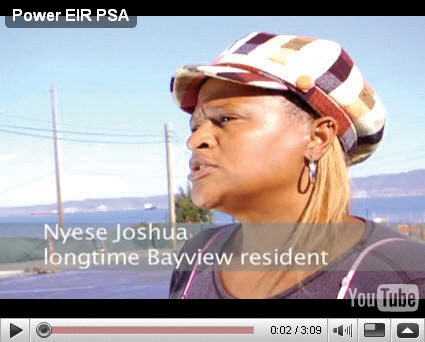 Nyese Joshua is a long time resident of Bayview Hunters Point and a San Francisco native. She can be reached by emailing nyesej@gmail.com. Why are you using all caps? That is a form of “yelling” on the internet. Most writers know this! This article is very troubling and very subjective. Was this article reviewed by the publisher first? I am very concerned about tone and spirit of this one-sided article. There is a lot of anger in this article. I am happy to receive such information. The horror stories and treatment of community groups from Sophie Maxwell is actually appalling to me and is probably causing her Mother to flip over in her grave. On the scale of 1 to 10 with 10 being the absolute worse, I would rate her easily a 12 for the lack of care and support as well as interest of her constituents. Why don’t you consider running for Supervisor, Nyese? I was on the bus last night and someone presumed I was involved in the recall and asked me why? I gave them information about my own feelings. I have submitted four Sunshine Task Force complaints against Maxwell for obvious abuses of power and all four determinations were accepted as legitimate by the SOTF. In fact, I talked with an attorney with the ACLU about Maxwell’s constitutional violations of freedom of speech and press and he agreed to get involved but asked that I give notice to City Attorney Dennis Herrera first. I did so and there was greater oversight of Maxwells abuses in public hearings. Never the less, she kept a disabled man with a degenerated hip waiting for three hours when she pulled the number one agenda item on the Peaker plant sitings, and without proper notice, heard it at the end of the hearing. Additionally, there are conflict of interest issues around her home in the BVHP project area, as well as her total disregard for health impact issues. Initially, she came out fighting to protect residents against diesel and mold. She dropped the fight. I lost all respect for her about two years ago and believe she can benefit from a blow to her political knee caps! BECAUSE A MIND IS A TERRIBLE THING TO WASTE! This week Sophie Maxwell cast a surprise vote, on the right side, for Just Cause Eviction protections, even though she’s a landlord, so whether the recall effort succeeds or not, it may have encouraged her to do the right thing a few more times than she otherwise would have this year. Rent control only shoots rents up…….look at history…..Berkeley, Santa Monica People seem to ignore history…why? Also heard that with the help and support of Sophie Maxwell she was able ti save the SF Black Infant Health Project from the butcher’s block this year in an effort to keep their services flowing to black families. Very interesting woman. Get rid of every supervisor in San Francisco and replace them with moderates….they chase away business, and have wacky policies that waste tax payer money and do nothing to improve the city's business atmosphere. I have moved 60% of my companies employees out of S.F. and moved to Oakland. The remaining 40% will move over the next two years….oops more lost revenues for S.F. schools and city projects due to radical policies.